Feast on a human buffet in this cheap and addictive iPhone game. Most zombie games cast you as one of the remaining survivors of an undead apocalypse, but not Infect Them All. Magic Cube's entertaining iPhone game lets you become one of three zombies with the goal of nibbling as many people as inhumanly possible. The result is a humorous, challenging and addictive action romp that's a steal at .99. Each of the game's 50 stages tasks you with turning a screen full of people into brain munching creatures. To do this, simply walk up to someone (either by tilting the iPhone or using an on-screen d-pad) and watch as your hungry alter ego snacks on its victims. 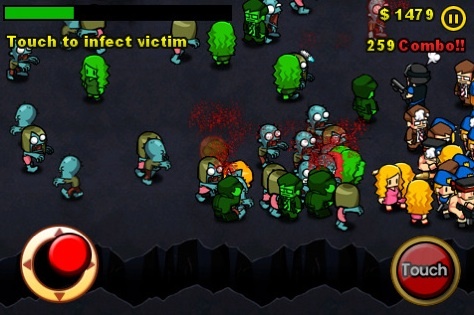 Allow the zombie to feast, and the person eventually explodes in a burst of red. Press the button on the bottom right corner of the screen, and you'll let go. This is where things get especially interesting. One bite is all it takes to infect someone with the zombie virus. In a few seconds, that person will also become a zombie and automatically go after the living. Since your health slowly deteriorates over time, it's in your best interest to bite as many fools as possible and let them do the work for you. Successfully completing a level earns much needed cash that you can use to upgrade the zombie's abilities, including health, armor, endurance, speed and recovery; as expected, the longer you survive, the more expensive things become. Staying mobile, though, is easier than it may sound. Infect Them All contains 20 different types of enemies, and while the innocent blonde ladies don't fight back, the others pack a wallop. You'll need to sneak up from behind and let your minions have a crack at them to proceed. In addition to the standard mode, the game also comes with Survival (see how long you can last) and Blitz (meet the required score in the time allotted). On top of that, Magic Cube included Openfeint support, with high score leaderboards and achievements. About the only thing wrong with this game is the repetition. You repeatedly perform the same old task with little variety, other than swapping zombies. But hey, Infect Them All packs a lot of content and fun for a bargain price. Besides, it's nice to play as the undead for a change. 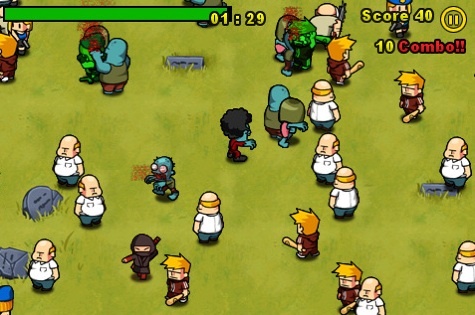 What's Hot: Playing as a zombie, infecting everyone, the cartoon style graphics, 50 stages, variety of enemies, only costs .99.